Homemade tortilla chips coated in a nap of tomatillo salsa and tossed with summer squash and corn make a cozy nest for baked eggs and a dose of melty cheese. A gluten-free and vegetarian recipe. I’ve been waiting all year to make a summery version of the baked chilaquiles that Erika and I concocted last winter. The originals, made with red enchilada sauce, kale and black beans, have become a favorite meal in our house to throw together for dinner or brunch. 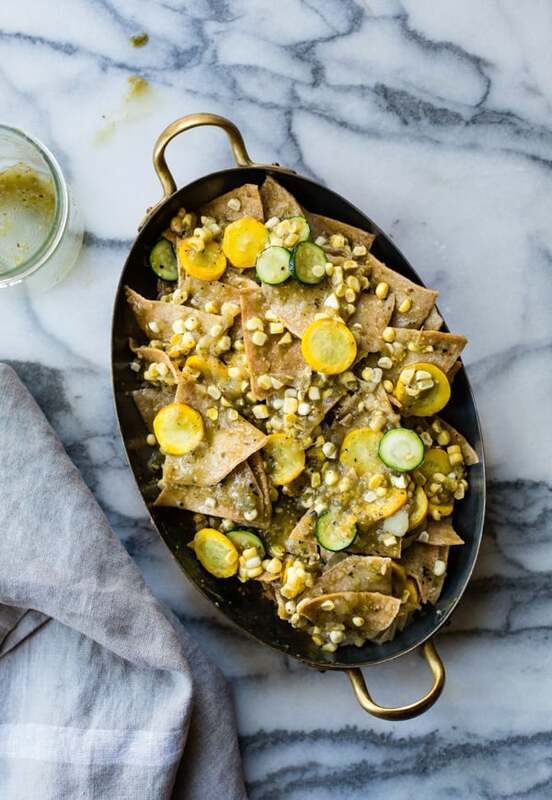 This version gets a warm-weather update from sweet corn, sauteed zucchini and shallot, and tomatillo salsa. Also ALL THE CHEESE. We could eat these for days (and luckily the recipe makes enough so that we will!). 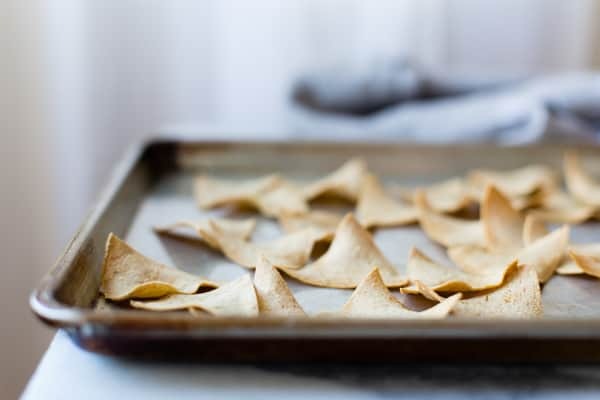 Baking your own tortilla chips in the oven is easy-peasy, and results in a lighter version than the more traditional frying method. 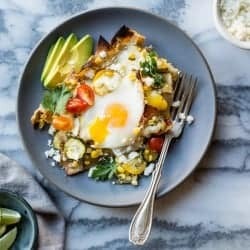 The chips get tossed with green salsa and vegetables, then topped with cheese and eggs that bake right into the chips. The long slow bake makes the eggs slightly custardy underneath their crispy tops. The whole thing is not unlike deconstructed and way less fussy enchiladas. Or really saucy nachos. We are fans. Also, how cool is my friend Amelia who made this beautiful bowl by hand, and also inspired the original baked chilaquiles by coming over for an impromptu brunch when I happened to have a jar of enchilada sauce in the cupboard? She is the best. 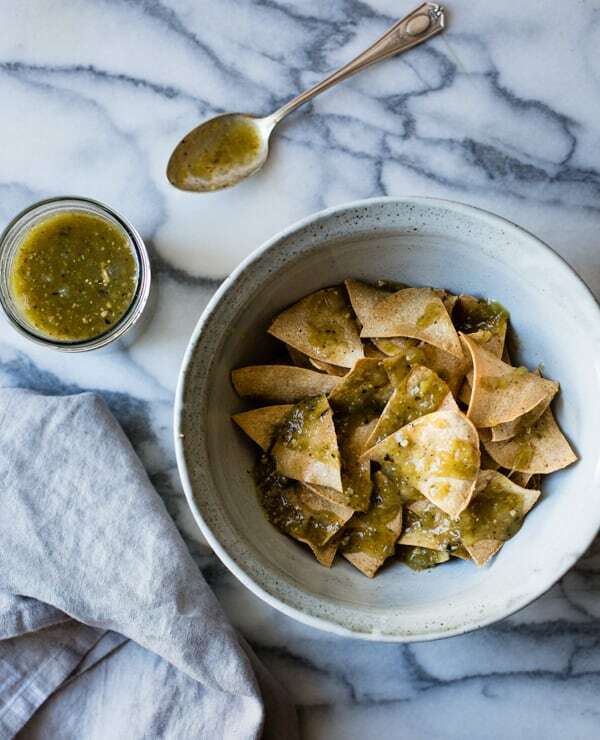 Come late summer, I look forward to making this dish with homemade tomatillo salsa. Until then, the storebought stuff works beautifully and makes this a doable dish for when you need foods in a hurry. I’m obsessed with the mild stuff from Santipapas which is organic and made here in San Francisco. Frontera also works well and is widely available, and sometimes you can find fresh salsas made locally in the refrigerated section of grocers. Feel free to mix up the vegetable matter here, too; the recipe is quite flexible and takes well to all sorts of variations. Fresh shelling beans would be pretty special, as would bell or poblano peppers. Feel free to double this recipe and bake it in a lasagna pan to serve a crowd. Cut the tortillas into sixths and divide between two rimmed baking sheets. Drizzle each pan with 1 tablespoon of the oil and a few pinches of salt, and toss with your hands to coat lightly. Spread the tortillas in an even layer and bake until golden and crisp, 10-15 minutes. They will be a little toothsome but will soften up considerably when salsa-ed and baked. 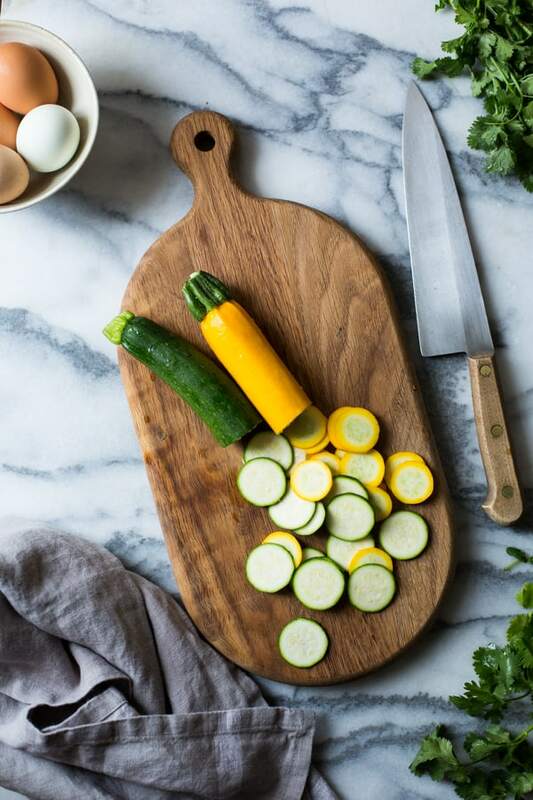 Trim the ends off the zucchini and cut them into fairly thin rounds. 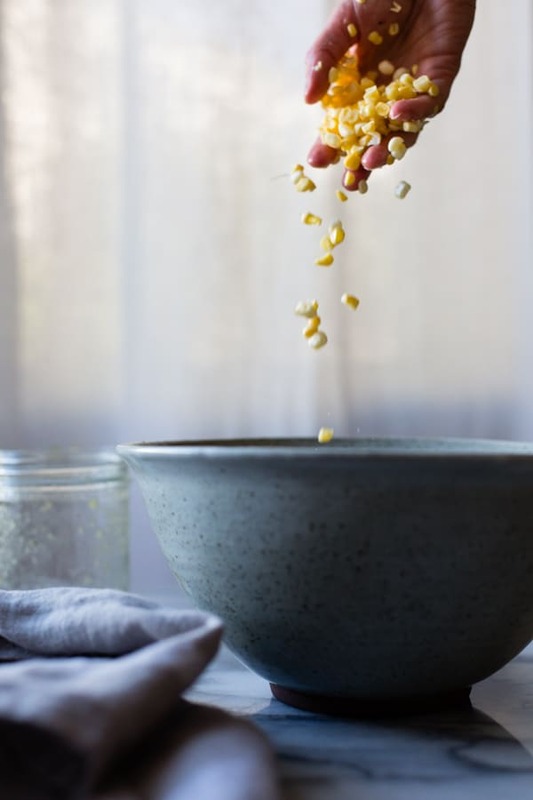 Shuck the corn and holding a cob in a shallow bowl by one end, use a paring knife to cut off the kernels. Heat a tablespoon of oil in a wide skillet set over a medium flame. Add the shallot and cook, stirring occasionally until tender, 5 minutes. Add the sliced zucchini and a big pinch of salt, and cook until crisp-tender, 5 more minutes, stirring occasionally. Place the tortilla chips in a large bowl, pour in the salsa, and toss with your hands to coat. Fold in the cooked zucchini mixture and the corn kernels. Oil a large baking dish (I use an 8x12-inch oval one) and spread in the tortilla mixture and any sauce hanging out on the bottom of the bowl. Bake until the chips are hot and starting to crisp a bit around the edges, 10-15 minutes. 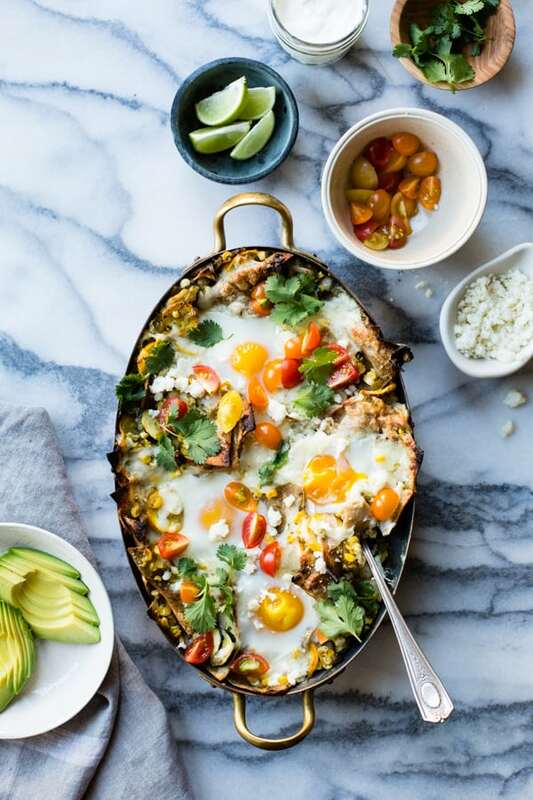 Remove the chilaquiles from the oven, scatter the cotija, tomatoes and cilantro over the top, and serve immediately with the salsa, avocado, sour cream, and lime wedges for drizzling over the tops. Irresistible! So colourful, so mouthwatering, wow. Love the bowl, love the photos, can't wait to make these. I don't know how I can have gone 31 years on this planet without having chilaquiles. I must change that immediately! This looks insanely good. Basically you need to drop what you're doing and come to San Francisco (and bring me some of that peach upside-down cake!). This is my comfort food right here. Dang, perfect summer meal!! 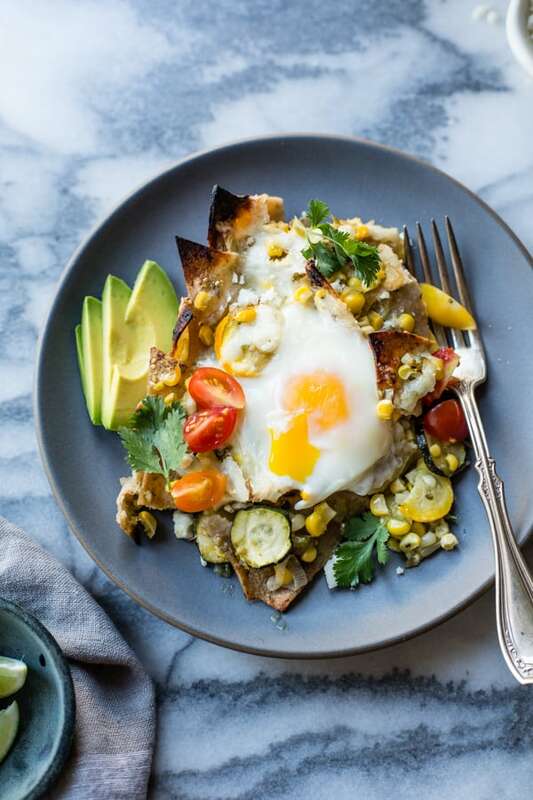 I've been obsessing over your chilaquiles for a year and now you've gone and done it with tomatillos. I have just spent a fair amount of time working in mexico and ate these every day. So. Good. I'm making these! Thanks for sharing the recipe! They're gorgeous and I love that they aren't fried. 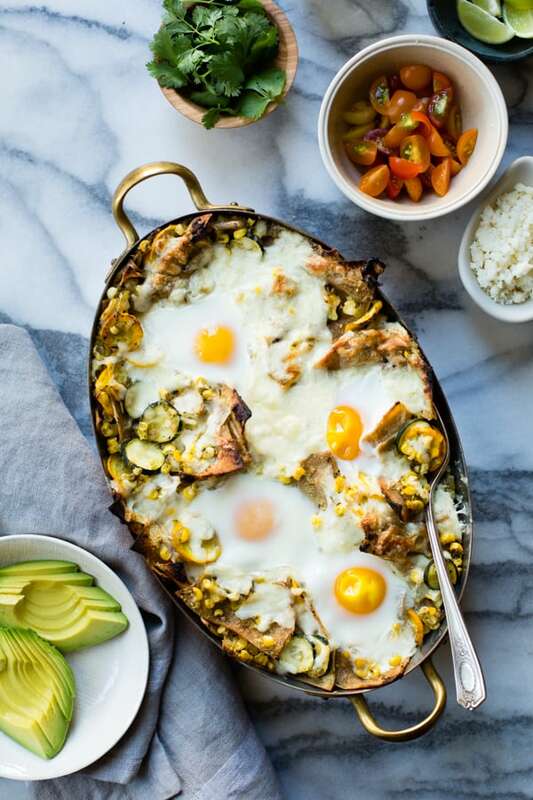 Hm, I always think of chilaquiles as a comfort food for colder weather but you have me convinced I should rethink that! This looks divine! I can definitely see these in my future. Thank you so much for sharing! This is fabulous, Alanna! Thanks to your inspiration, I've been making this since your last post! It comes together with ease and is delicious with a variety of seasonal veggies. We love this! Thank you so much! This is so fabulous! I've never made chilaquiles at home before, but I've had homemade baked tortilla chips and they are the bomb. This looks seriously fantastic, as does the woodworking of your friend Amelia! How beautiful! It's fun to see two artists collaborating in their different mediums. Aw, thank you Sydney! I'm indeed lucky to have such talented friends. Happy summer to you as well. 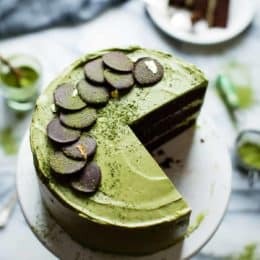 This looks amazing and I am definitely going to be making it. I have 11 people in the house this weekend and I'm still nailing down dinner for tomorrow. Not sure if this will be it, but it's going on my list! Thanks Bonnie! Yikes, that's a lot of people – good luck! I can't decide what looks better in these photos, the chilaquiles or those gorgeous props! Loving that bowl your friend brought you (as someone taking beginner pottery, I can tell ya it's not easy! ), but also that handled baking dish! Be still, my heart. Thanks again for the inspiration! Why, yes. I would like to take a nap in this cozy little nest you've made. Just stunning! And ALL THE CHEESE, please! I've never had chilaquiles before! Mexican food is still stuck in the 80s here in Australia, but we are slowly seeing more modern takes on it. 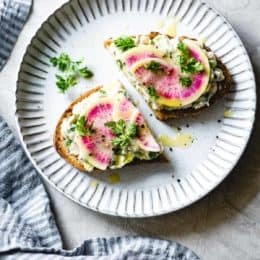 I know this gorgeous vegetarian dish will be most welcome in our house! Pass the margaritas! That's such a shame! I missed it so much when I lived in Italy for a year, so I get it. Let me know if you give this a go! That looks absolutely amazing!!! 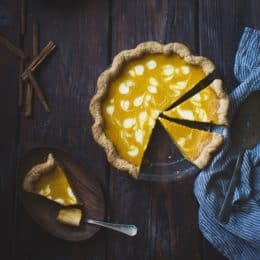 I love your food photography! I live in South Korea and green salsa is impossible to find :( can you recommend any other sauce substitute? Hi! Enchilada sauce is pretty traditional, though I don't know that you'll find that any more easily. If not, I can only suggest making your own – it's pretty simple! Let me know what you end up doing. SPEC-TA-CU-LAR!! You are so good at this, Alanna! D'awwww! The feeling is very mutual. These photos make me weak in the knees. Only to be outdone by the yumminess that is corn tortilla chips becoming half crunchy half sogged-out in chilaquiles. This is how comfort food should be done! So happy to see the summer counterpart to the other fab recipe! Aw, thanks Katie!! 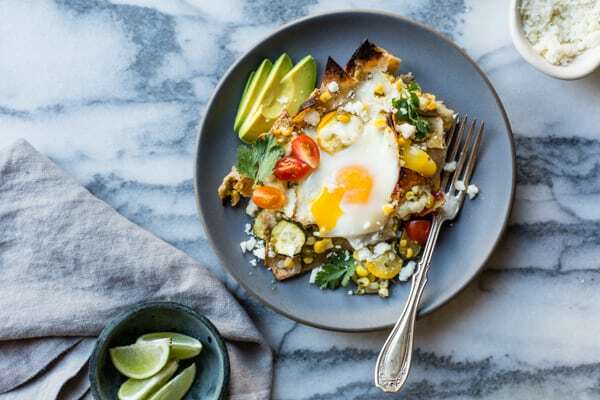 LOVE your chilaquiles description – spot on! Oh! Alanna, do I need to say how much I love your photographs! All of your photos are so good. I am just curious, the big oval shape bowl and the wood handle knife – where are those from? They are so gorgeous! Btw the bowl your friend Amelia made, is so beautiful! Let's be neighbors so we can have the most epic pot lucks. :) Thank you so much for the kind words! Yes, Amelia is talented beyond belief! I'm sooooooo lucky. For someone who loves Mexican food as much as I do I can't believe I've never tried chilaquiles before! I gotta change that real soon because these look awesome and have all my favorite ingredients in them! Somehow I found this recipe this morning and thought, “I have all the stuff to make these!”. Made a quick tomatillo sauce, added some black beans and extra veggies and just used an oven-safe deep skillet to do the whole thing in one dish. It was incredibly good. Thanks for a fantastic recipe that I will absolutely make again!